Guilbert & Betelle in Advertisement » James Betelle, Where Are You? I’ve come across many ads for contractors and building equipment suppliers that all specifically mention Guilbert & Betelle, so I thought it would be fun to show them all together. Wallace & Tiernan’s “Chlorine Control Apparatus” (left) appeared in the January 1928 issue of American School Board Journal, not-so-coincidentally the same issue featuring the artice on Columbia High School. Their ads are rather whimsical, this one with the tag line “Swim in Drinking Water”. 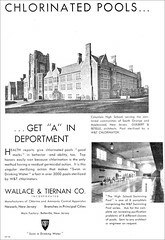 Wallace & Tiernan followed up with a full-page ad in Architecture, which includes a picture of CHS’s pool, the tag line reading “…Get “A” in Deportment”. 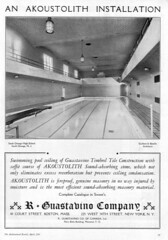 The ad for The Gaustavino Company appeared in the April, 1930 issue of Architectural Record. The photograph is also of CHS’s pool, which features a barrel-vaulted Gaustavino Akoustolith tile ceiling. In the Fiske Weathervanes ad, the photograph labeled “Maplewood N.J., High School” is actually Maplewood Junior High (now Middle School). 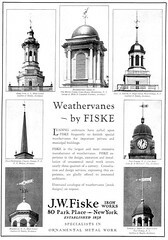 The rest of the ads appeared in the May, 1932 Architecture, no doubt because it had the G&B feature article The Trend In School-Building Design. The remainder of the ads may be seen here.